This report recently went out to all of the game Backers on Kickstarter. The actual download location is available only to the Backers. I new version is available for download at [URL HIDDEN]. Included in the .zip archive is a map of the locations. A quick word about the map: where you see the location names highlighted in blue, the blue portions indicate a shortcut in the game navigation system (meant for speedier play testing only). For example, on the map is the “Military Encampment” location with the word “Military” in blue. When you are playing the game, type “xmilitary” at the cursor and you will be immediately taken to the Military Encampment. This will work for any of the locations in blue. A big “thank you” goes to backer Vivianne D. for her work on the navigation code in Inform 7. Now when you type “dir” at the cursor, the game will display all possible directions (unless specifically hidden) based on room relative location definitions. Previously, I had been hand coding all those directions. Otherwise, changes in this version are not major. Cleaned up more descriptions, added some detail, etc. Feel free to play it and let me know what you find. In an upcoming release I will be publishing a guide that provides a listing of the possible commands. I’ve revised the game map slightly from the last published version. In this new map, there are some altered and additional paths between locations. Also, several of the buildings (represented by red squares) have interior rooms, providing more locations for exploration. These buildings are marked with the light blue circle around them. This map is being implemented in version 11 or the test program. I’ll have that version published soon for the HWLN Kickstarter backers. A quick update: there is a new playable version of the game available for backers of the original Kickstarter project. Here’s what I shared in a message to the backers (removing the access instructions for the actual game). This version includes some minor navigation/map description updates. The main change here is in the addition of some non-player characters (NPCs). a farmer – in the Palace Green. You can use the command “ask the farmer about Anderson’s” when you encounter him to see what happens. a cordwainer – ask him about shoes when you find him. For Jefferson, Henry, and the farmer, there is additional dialog, but I won’t say here. It’s not likely you’ll be able to guess what to ask them about (though if you know Williamsburg histry you may be able to figure it out). Don’t worry about that, as the context of the game events will give you clues/hints. In the meantime, if you do playtest (or even if you don’t), feel free to let me know what kinds of things (nouns) you might ask about and expect to get some sort of answer. Your feedback will give me good player’s perspective. More NPCs will be added, along with greater dialog vocabulary. Other considerations will be making dialog dependent on time of day, location, and even what the player may have learned from other characters or in discovering certain things about the environment. NPCs will not be “stuck” in the same location, and the time of day will determine where they are. For the Backers of the Kickstarter project, I’ve posted a Blorb Glulx Game file that will allow the player to go through the physical location map, seeing descriptions, and testing a few other commands as well. If you’re a Backer, check your email for the Update that has the location of the file download. In my last blog post (Fun with Maps) I discussed the complexities around map development for Interactive Fiction, especially given the design tension between maintaining historical accuracy and fostering engaging gameplay. During my most recent trip to Williamsburg last September, I found that the Colonial Williamsburg Foundation helped address the map dilemma by issuing a simplified version of their visitor map. 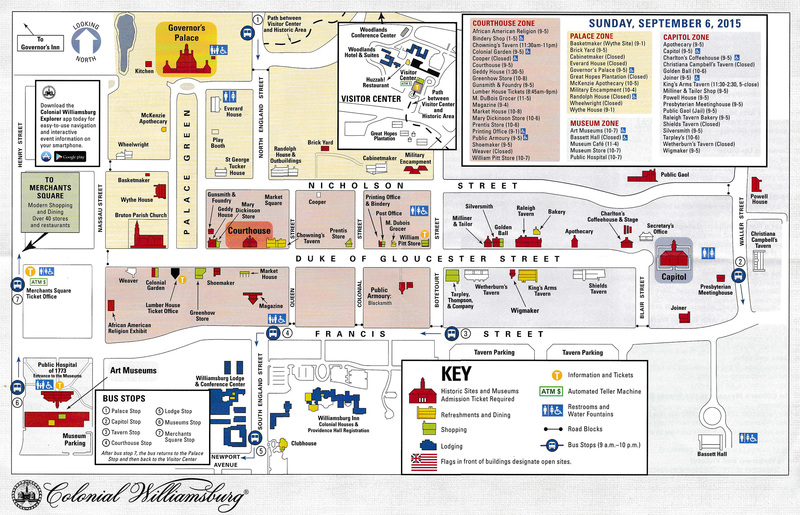 This is the visitor map that is currently being published (along with the daily events in the colonial city area). 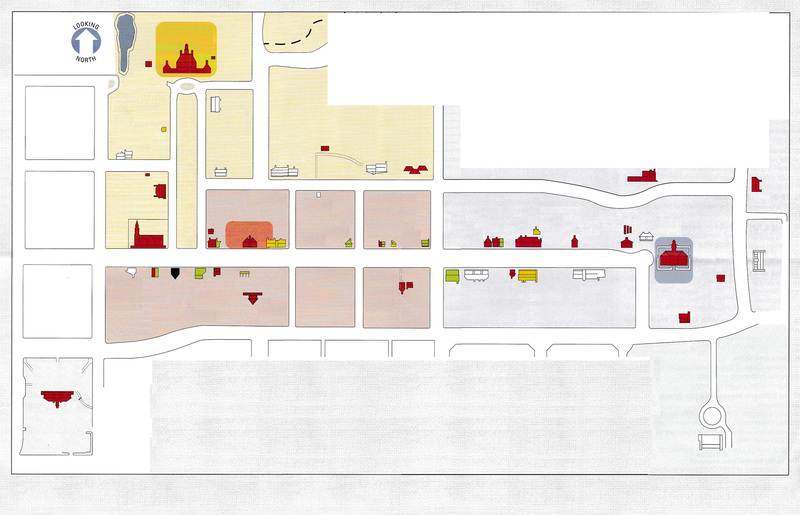 I took this map and eliminated the extraneous information based on the actual game and story requirements. That gave me a very clean map from which to work. You can see that this map provides a layout of the relative positions of buildings, the streets they are on, and distance information. Finally, I pulled the background out in order to have the unadorned map to use in building navigation functionality within Inform 7. The red boxes represent buildings or structures that have further navigation within, while the green boxes are simply outside locations. 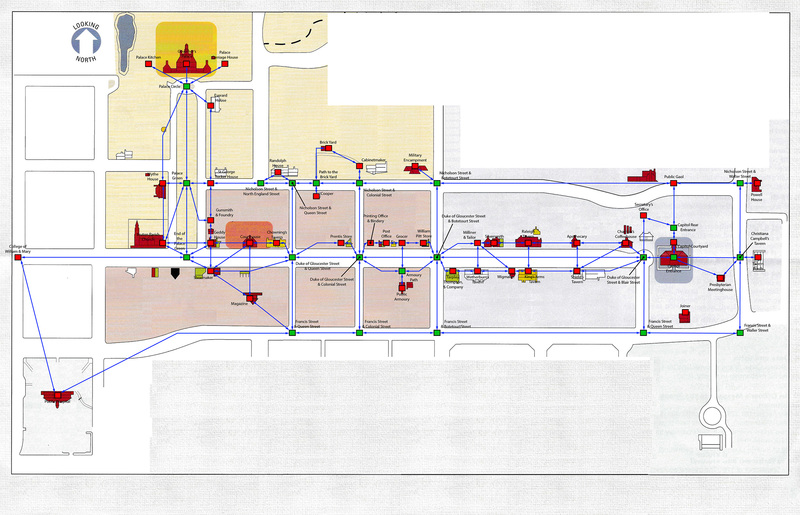 Using this map, I was quickly able to create basic navigation in Inform 7, and I am using the map as a location checklist for the location descriptions. (Additionally, I am creating the logic in Inform 7 to handle multiple stops at the same location, and requests for more information regarding locations. In addition, this map allowed me to visualize some navigational shortcuts to help with the flow of the game. For example, I’ve created a custom command “street” that functions at many of the building locations on the Duke of Gloucester Street (that’s the main street running from the College of William & Mary in the west to the Capitol Building in the east). When a player is at the entrance of one of those buildings, using the “street” command will take the player to one of a number of unmarked positions on the Duke of Gloucester Street, between the two cross streets that apply to the building where the player is. From the unmarked position, the player can see the buildings up and down between the cross streets and choose to navigate directly to any of them. These unmarked positions on the Duke of Gloucester Street are not accessible through standard compass-direction navigation. Within the next week or two, I’ll have a robust version of the game navigation completed in Inform 7 and available for download to the original Kickstarter backers.